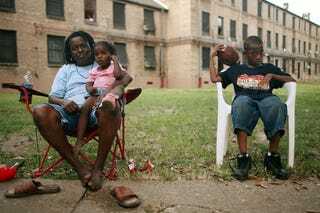 Public housing in this country is rapidly becoming endangered, and with it, the lives of low-income people. Public housing provides a safety net for the working poor and those on a fixed income, which is critical in today's housing market considering that as of 2008, there was no county in the United States where an individual working 40 hours a week at minimum wage could afford a one-bedroom apartment at fair market rent. The state of public housing is the result of decades of bad policies, which has greatly impacted low-income communities, predominantly of color, throughout the country. This reality is uniquely portrayed in a recent report, We Call These Projects Home: Solving the Housing Crisis from the Ground Up, by the Right to the City Alliance (RTTC). RTTC is a national alli­ance of community groups organizing to build a united response to gentrification and displacement. The report documents the public housing crisis, how it affects residents, and how we can reverse bad policy, all by going straight to the source — public-housing residents themselves. Through We Call These Projects Home, RTTC elevates the voices of residents across seven cities: Los Angeles, Miami, New Orleans, New York City, Oakland, San Francisco and Washington, D.C. What they say, what they find and what they recommend deserves our attention. Decades of ineffective and misguided policies have fueled disinvestment, demolition and deregulation of public housing. The consequence has been mass displacement of residents, destroying critical community networks and scattering residents to the wind. Meanwhile, millions of low-income people still need the safety net that public housing provides — in the cities studied in this report, there were more than 250,000 people on the waiting lists for public housing and almost 150,000 homeless. Residents who participated in the report spent, on average, six years on the waiting list to get into public housing. The story of Emma Harris brings these numbers to life. Harris is a resident from San Francisco who spent two years trying to get on the list for housing and then another seven years actually "waiting" on the list. So, for those nine years, Harris was forced to stay in unsafe and unsanitary quarters, causing her to suffer from constant physical sickness and mental depression. Meanwhile, while Harris and others like her waited endlessly, over 120,000 public-housing units sat vacant across the country. We need immediate and longer-term change. We Call These Projects Home puts forth a new vision for public housing that recognizes and elevates its strengths, and finds ways to make it better by increasing funding, maintaining communities and empowering residents. For example, Congress can and should immediately change the law that prevents the building of new public housing. Congress also should pass the Together We Care Act, a bill introduced by Reps. Barney Frank, Nydia Velazquez and Maxine Waters that would create jobs and increase access to services for public-housing residents. The Department of Housing and Urban Development (HUD) should push to fully fund resident participation, and purposefully direct these funds toward opportunities for residents to be provided with the ability to be decision-makers regarding their own homes. As HUD is poised to introduce "Transforming Rental Assistance" to Congress, an initiative aimed at sweeping reforms to public housing namely by opening it up to the private market, We Call These Projects Home comes at no better time. Through it, RTTC has provided a vehicle for the resident perspective to be heard. Now the question is: Will the closed corridors of Washington, D.C., finally be opened enough to listen to these voices? Let's hope they are before it's too late and we unleash the nation's greatest housing resource to the throes of the market. Bill Quigley is legal director at the Center for Constitutional Rights in New York. Tony Romano is lead organizer for Right to the City Alliance.